I’d finished packing my backpack the night before so I could work a half day before heading to the airport. This was not the best idea, as I felt like I left 10 loose ends behind. Regardless, Nicole and I had a quick lunch a Arby’s and said our good byes. The trip officially begins. I brought a pistol with me for bear protection. It was taken into the airport in a locked case and I was surprised how easy the check-in process was. A couple of hours into my layover at Denver, Kevin Colon finds the gate. It’s great to see him again. We figure out it’s been 3 years since our last visit. I meet Jayson Ayers for the first time and the three of us sit down for a beer and a sandwich and begin to speculate about our trip. 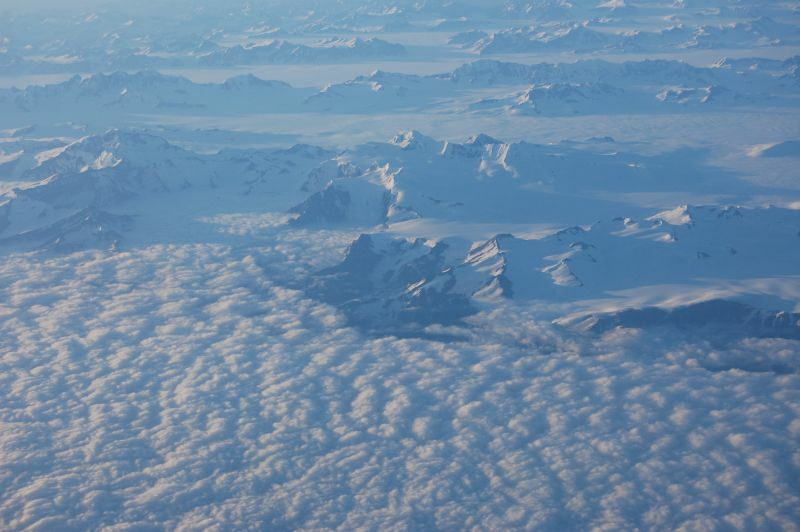 The flight to Anchorage, Alaska reveals some beautiful scenes of mountains poking through the clouds. I’m getting excited about the trip to come. I sit and watch luggage being unloaded from the plane and noticed a small, hard-sided case that is completely destroyed. Turns out, it’s Jayson’s gun case. Gun and bullets are both about to fall out of the case. None of the workers or airport visitors seem alarmed. Strange. We race to Wal-Mart and find it after only 1 U-turn. We make it in the door but the guns and ammo section closed, so we can’t purchase the bear mace. No problem, Shauna the manager takes care of us and re-opens the registers. Shauna is the most beautiful girl in Alaska right now. Unfortunately, that isn’t saying much. Dan’s flight doesn’t arrive for another few hours, so the three of us kill some time at TGI Firdays. It’s past midnight, completely bright, and completely dead. They stopped severing food so we have a beer instead and wait for Dan to arrive. An hour later, we’re back at the airport and I meet Dan Hensley for the first time, we stuff the car, and head out to find a place to camp. We drive for an hour and a half, apparently past our intended camp ground. Jayson declares that it’s not a problem, some people from Denver said we could camp in their front yard. We find the gravel road, follow the directions, and there is no house. We backup and try again, but the gate colors are wrong and the Warning / Trespassing / Keep Out signs are not as described. We finally pull into someones driveway and Jayson thinks this is the place, even though we didn’t follow the directions. We’re tired. It’s still daylight. It’s 3 AM. We don’t care. We pitch tents and hope we don’t get shot.